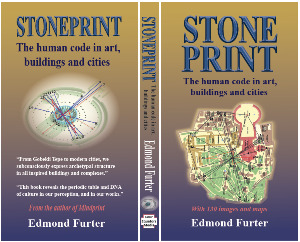 Stoneprint, the human code in art, buildings and cities (Edmond Furter, 2016, Four Equators Media, 400 pages, 170mm x 295mm, 130 illustrations) resolves the mysteries of correspondences between ancient cultures. The book reveals the core content and ‘grammar’ or ‘DNA’ of culture. We have an innate subconscious compulsion to express a specific, complex, archetypal set of features, in sequence, and on an axial grid, in all our works. The book demonstrates the innate universal structure in our works, including art, rock art, houses, kivas, temples, villages, sacred sites, monuments, pyramids (Egyptian, Chinese, Olmec as well as Mayan pyramid fields), and cities. The examples range from the Ice Age thaw at Gobekli Tepe, Malta, and Scotland; to prehistoric sites such as Babylon; semi-historic sites such as the Giza, Avebury and Stonehenge landscapes; historic sites such as Ephesus, Rome, Axum, Quebec, and Cape Town; and across all continents and cultures, including Africa, the far east, south America (including Nazca) and North America (including Mystery Hill). Among the cultural media that carry the human code, and camouflage it from our conscious mind until revealed by structural analysis; are rock art, ‘fine’ art, ritual, myth, poetry (such as two examples of Babylonian building rites, and two poems by William Blake) buildings, sites and region (such as Babylonia). Nature also express archetypal structure. Stoneprint reveals several direct links between subconscious cultural expressions, and the periodic table (when charted on a spiral as by Maurice Peyroux); chemical elements; reflexology charts of our palms, irises, teeth, earlobes and inner ears. Our eye-hand-mind co-ordination expresses the same universal structure in building sites, even by different architects, and different generations of rulers and builders. Stoneprint, the human code in art, buildings and cities, now enables conscious access to our subconscious behaviour, which is revealed as standarised, rigorous, universal, eternal, complex, yet measurable. The book places the discovery of subconscious behaviour (first reported by the author, Edmond Furter, in Mindprint in 2014), in the context of the esoteric crafts of alchemy, kabbalah, cosmology, astrology, and art; as well as the context of each human science: art history, archaeology, anthropology (with a humorous detour into popular archaeology), psychology, and sociology. The implications of the discovery of the universal stoneprint structure, for popular culture (including various schools of popular archaeo astronomy) , and for the human sciences, are significant. Order the book Stoneprint, in Europe at E30 plus postage, from Four Equators Media via [edmondfurter at gmail dot com], payment on Paypal. Order the book Stoneprint in the USA at $30 plus postage, from Four Equators Media via [edmondfurter at gmail dot com], payment on Paypal. Order the book Stoneprint in South Africa at R300 (including free postage to any Postnet account in South Africa; or plus R30 postage; or plus R60 per courier), from Four Equators Media via 011 955 6732 or [edmondfurter at gmail dot com], payment on Paypal. The index indicates the broad scope and depth of 28 years of research reported in Stoneprint. Each relevant craft and science is placed in context. Natural expressions are compared to cultural expressions. Each building site is illustrated by a map, and at least two pages of detailed structural analysis. 47 Popular Anthropology: Who did it? 122 Gods or liver maps, which came first?